New prints at Treadle! Paint by Carrie Bloomston for Such Designs. Like her last collection, Collage, the theme is mixed media. Newsprint and paper clippings join bold painterly colors evocative of hand-applied brushstrokes, finding the area where fun and artistry overlap. This collection is ideal for bags, aprons, quilting, and crafts. For more ideas, check out the Paint Project Lookbook at Windham Fabrics. We have some lovely new sweater knits in the store in an open lace knit. They are wonderfully soft and drapey in 100% cotton. Ideal for making those little transitional pieces for the changing seasons! New Class at Treadle! Colette Knit Dress! Have you been longing to sew with knits? Want a cute, comfy, versatile dress you can make in a few hours? Sign up for the Colette Moneta class at Treadle Yard Goods! You'll learn all the basics of sewing with knits - no serger required! - and get step-by-step instruction to create a flattering knit dress. The Moneta is a pattern with options, including a fab collar. You can even download more pattern pieces online for extra variations! To see our full listing of classes, visit the class page at our website. There are so many exciting classes to choose from! We have some lush new knit jerseys in heathered autumnal colors. There are so many innovative options for pairing the solids with the stripes. Go simple and make a solid tee with striped sleeves, or try a Marcy Tilton style with bold piecing and pattern mixing! 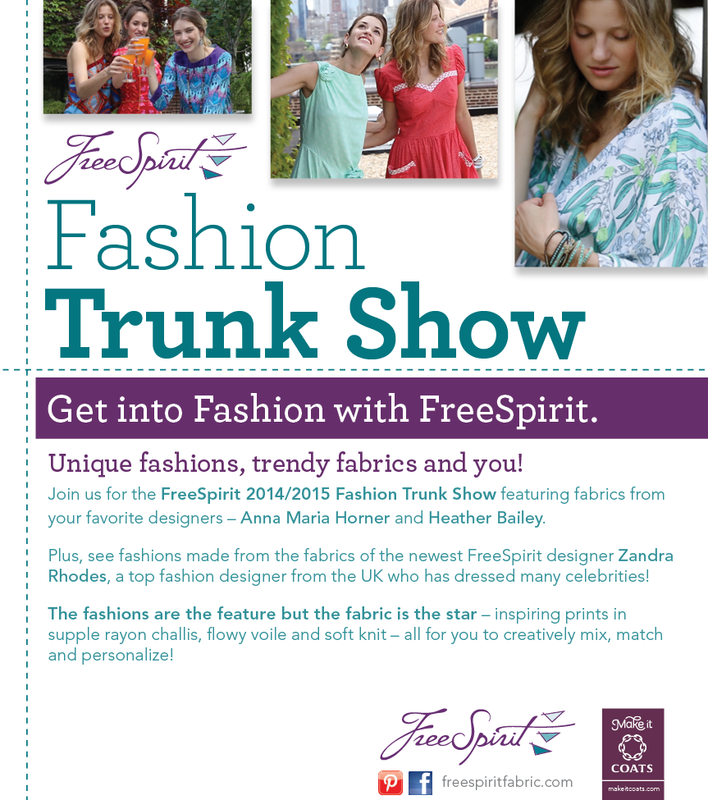 Treadle is excited to host the FreeSpirit Fashion Trunk Show! Featuring knit, rayon, and cotton voile fabrics from designers Heather Bailey and Anna Maria Horner, this trunk show is packed with inspiring garments! The trunk show runs through Sept. 22nd, so stop by and see it before it's gone! We have a bunch of new batik cottons in the store. Made with a wax-resist dyeing process, batiks have an organic irregularity that is not seen in conventional prints. Each yard varies slightly from the last, making each piece subtly unique. But perhaps the most appealing quality of batik prints is the color! Rich and saturated, deep or bright, batik's colors make any project pop! Do you love to sew with wool? Interested in winning some fabulous prizes? Enter the Minnesota Make It With Wool Contest! Garments entered in the contest must be made from fabric or yarn with a minimum 60% wool content. At Treadle, we have plenty of options to get you sewing! The contest is a fun way to explore the creative possibilities of wool. Create a sleek little black dress from drapey wool crepe, a cozy cardigan from a soft cashmere knit, or a smartly tailored pantsuit in tweed or gabardine. You could stick to just sewing, or add knitted, crocheted, embroidered, or handwoven elements – just make sure to use wool! For entry forms and more information, visit www.mlwp.org/make-it-with-wool/. Adult, teen, and pre-teen age groups are eligible. Send in your entry form by November, 14th, 2014. The contest will be held December 6th, 2014, in Chaska, MN. You can also check out MN Make It With Wool’s Facebook page for updates and inspiration! We have a whole new schedule full of classes at Treadle! Now through December, we'll be running classes ranging from beginner to advanced, from garment construction and historic techniques to quilting and crafts. We have kids classes, too! New this Fall: even more knits classes, including the Colette Moneta; stylish wallet and bag classes, trouser details, and more! You can see the complete list here at our website's class page. To register, call us at (651)698-9690, or stop by the store. This beautiful ombre gradient pattern stretches all the way from one selvage to the other, fading from deep blue to turquoise to olive and pale yellow. It would be equally beautiful in a quilt or dress! It's never too early to think about flannel pajamas! A simple pattern and some cozy soft fabric and you are all set for comfy winter evenings. We keep a pretty diverse selection of flannel at Treadle. There are always lots of novelty prints, but flannel jammies aren't just for kids! We have plenty of floral and graphic patterns for those with more adult tastes. Do you feel great in the clothes you sew, or do well-fitting garments elude you? Do you have pesky little fitting issues you just don't know how to solve? Then this book is for you: The Complete Photo Guide to Perfect Fitting by Sarah Veblen, longtime Threads contributor, sewist, and author. Most of us know to make muslin mock-ups when we want a really good fit, but don't always know how to read the pulls, stress wrinkles, or bagginess and what to do about it. Sarah Veblen walks you though fitting multiple garment types on various figures, showing real-life examples of how to read the fit. Skirts, pants, and various types of bodices and sleeves are covered, as well as how to drape a dart, how to fit over a full bust, adjustments for petite figures, and so much more. You'll also learn how to transfer your changes to the pattern so your final garment will reflect that perfect fit.